If you have been fishing into the world of real estate investment, there are certainly ways to go about it. For an investor, there are a plethora of housing options such as leasing, renting, service apartments or even list a spare room on Airbnb. But there is another niche real estate market that has been left untapped. If you are located close to a college campus or looking at investing in a location close to a college campus, you might want to consider tapping into off-campus or student housing market which could prove extremely useful and fruitful. Since decades, countries such as the UK and the USA have been enjoying the benefits of students rushing to secure limited housing options. The ever-replenishing tenant base of students surrounding college campuses can be alluring to many landlords. Globally this segment, which has already attracted 200 billion dollars of investment, is essentially operated on a lease rental basis. Student housing in London has gained prominence mainly because of the higher yield rate, which has recently been 4.5% versus commercial yield rates of 3%. Globally, the number of students abroad is likely to double to 8 million by 2025 according to OECD ‘Education Indicators’ estimates, which also predicts that London will have 2,24,000 students in the next decade. As long as the need for good education continues, demand for student housing will positively see a forward trend. With this trend, India is one country which will never lack students, as education is key for most of the Indian families unlike in the west. It could be from the standpoint of continuing a legacy of good/higher college degree in the family or marriage or it could just be for a simple reason of getting a good job. Student housing essentially comprises of buildings that primarily offer residential accommodation for large numbers of students which give them the option of living close to the place where they learn. The private development of student housing by a partnership with the institution provides interactive and enriching student living experience possible for the least cost. These partnerships allow the institution to benefit from the efficiencies of private development. Student housing also paves way for retailers, restaurants and cafes, banks, fitness centers and many such providers to establish their stores allowing them to be profitable leading to growth. The main reason backing this demand is high enrollment rates and lack of supply when it comes to hostels. The skyrocketing prices of paying guest accommodations and the harassment students face by the private accommodation owners creates demand for student housing. One of the main problems that a student faces when he/she is looking for house for rent is that the landlords don’t want to have college students as tenants due to their lack of trust on the student’s character, possibilities of frequent late night parties, large groups hanging out at the house, possible delay of payments and the list goes on. As someone’s loss becomes another’s gain, this creates immense scope for developers and investors meeting the demand for student housing in the country. The education sector in India is poised to witness major growth in the years to come as India will have world’s largest tertiary-age population and second largest graduate talent pipeline globally by the end of 2020. Currently, higher education contributes to 59.7% of the market size which is the largest in the world enrolling over 70 million students; while in less than two decades, India has managed to create additional capacity for over 40 million students. 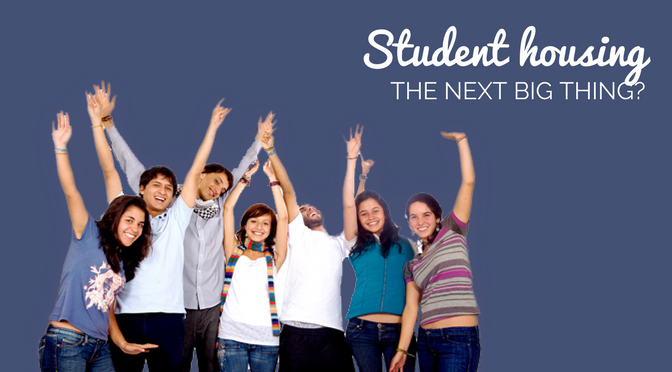 Although student housing is still fairly a new concept in most of India which still operates on a hostel, paying guest or boarding house basis, student housing could be a relief for students looking at pursuing higher education and want to lead a student life that gives them enough flexibility to choose their housemates, or choose to live with spouse and children, if married. The educational hubs in India are Delhi-NCR, Pune, Chennai, Mumbai, Kota, Jaipur, Nagpur, Kolkata, and Hyderabad. Pune, Delhi-NCR, Bangalore, and Chennai have witnessed a strong growth in the number of student enrollments in recent years and also increase in a number of private higher education institutes. They have relatively more number of outstation students compared to other Indian cities. Some of these educational hubs have created growing demand for student accommodation which the educational institutes are not able to cater. Mumbai has fallen to lower positions in catering education demands firstly due to a high living cost in the city for the students; secondly, due to the shortage of land and which has thus increased real estate prices. 1) Full occupancy is typical for student housing – A student housing will ensure full occupancy throughout the year as more and more students are enrolling for higher studies. In USA and UK, the average waiting period to be assigned with a house is six months once the application is submitted. It certainly cannot be less than six months in India given the growth in the education industry. 2) Ability to increase rents – The students show up regardless of local unemployment or interest rate levels, and they pay the going rate since they must live somewhere — besides adding roommates can keep even increased rents affordable. 3) Growth – High demand by the students for accommodation will lead to a growth of real estate sector invariably providing the opportunity for investors to invest more. 4) Expansion – Once the niche market of real estate is identified, an investor will focus on becoming an expert in the sector. This gives the investor an idea of what’s driving the target market currently, what risks are involved, and most importantly where the market is headed in the short and long terms. This allows him to expand his investment in different target locations where he foresees business opportunities. For example, if an Investor has seen success after investing in student housing infrastructure in Chennai, he will look at other cities like Delhi, Bangalore or Pune and look at an expansion plan in these cities. 5) Profitability – While making an investment in residential properties for student housing, location is often the biggest factor in appreciation. As the neighbourhood around a home evolves; adding bus routes, restaurants, shopping centers, playgrounds and so on, the value climbs. Also, one can expect a return on investment much earlier due to high demand and therefore enjoy profitability. 6) Branding – A well-maintained property, fully occupied and enjoying profitability, enjoys the benefits of almost free branding as technology these days plays a key role. Information via social media tools flows quicker than word-of-mouth and save from expensive advertisements in the media. 7) Recession proof – Unlike the larger rental market which is subject to economic swings, student housing is recession-resistant, and may well be practically recession-proof. College enrollments aren’t as vulnerable to the ups and downs of the economy as the office, retail and other sectors. Student housing is a relatively stable investment. Regardless of how one chooses to invest, with growing demand for housing outstripping its supply, the investment returns are expected to continue far longer. This being a new market and hardly untapped in India, it could be worrisome for few with the kind of risks that they might have to encounter. However, if we look back, no one thought malls, Airbnb, Uber or cell phones would see the demand, usage and growth globally that we see now. These have now become moneymaking asset classes. The demand for student housing in India will continue unabated and in fact grow rapidly, so this segment of real estate has all the hallmarks of becoming a revolutionary new product in Indian realty. Reading into the success of this segment at USA, Paris and UK, penetrating this segment seems to be a wise alternate move for Investors.